Surrounding states have reported armyworm alerts and damage. Furthermore, DATCP’s WI Pest Bulletin has indicated a moderate flight so far. Although I’ve only received a few phone calls so far, it would be a great time to start spot checking likely areas for damage. 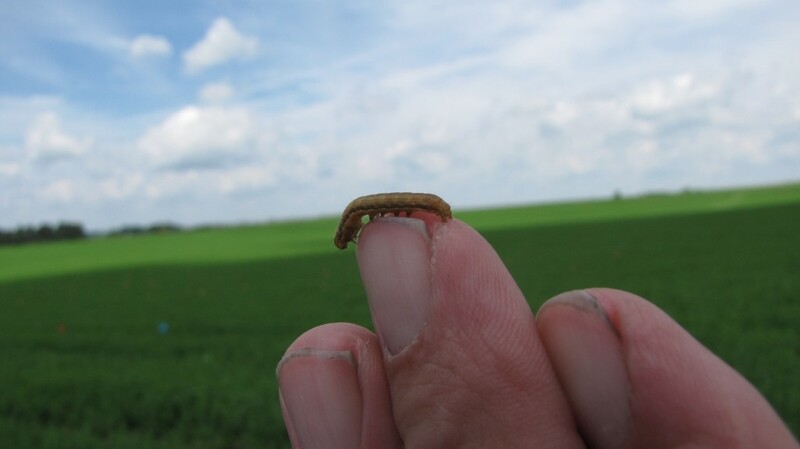 Armyworms are often recognized as grass feeders, however, injury can occur to soybeans and stand loss can occur under extreme circumstances. Armyworm larvae feed on leaves and this feeding will appear to have ragged edges. The migrating moths are most attracted to fields with grassy cover including, wheat, cover crops, emerging weeds and sometimes alfalfa. Larvae are nocturnal and can be difficult to find. 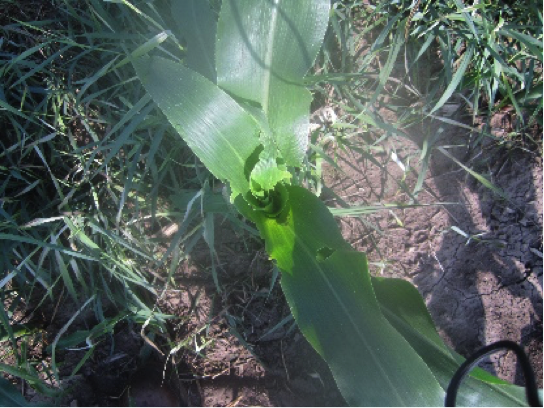 Check under leaf litter during the day or you may find them hiding in the whorl of corn plants. However, leaf feeding is usually apparent. Larvae may grow up to 1 ½ long, however, it is important to find infestations before they reach this size to prevent as much economic damage as possible. Larvae are hair-less, have alternating dark and light colored strips, a faint orange strip on each side of the body and a light colored abdomen. Color intensity of these stripes can vary significantly. Their head is tan and has net-like marking on the compound eyes. In corn and soybeans, damage may with either be uniform, spotty and/or found along field margins. Low infestations in corn (15-20% injured plants) may warrant a revisit because egg hatch may not be a short, well-defined occurrence as you might expect from overwintering insects. If 50% of corn seedlings have injury, control maybe be warranted if larvae are still relatively small which indicates significant feeding may yet to come. Remember, as long as the seed furrow is closed, the growing point is not exposed until V6 and corn can recover. Soybeans may not be a preferred host but are more susceptible to stand loss because growing point(s) are exposed. Wheat and other small grains are also at risk and damage may be concentrated in lodged areas. Check all fields closely by looking for both leaf defoliation and head-clipping. An economic threshold of 3 or more larvae/square foot has been established. However, crop stage and presence of head-clipping may influence your decision.